Stephen Brown produces restful contemporary paintings with real interest. Light and atmosphere are always a compelling combination in Stephen Brown paintings. 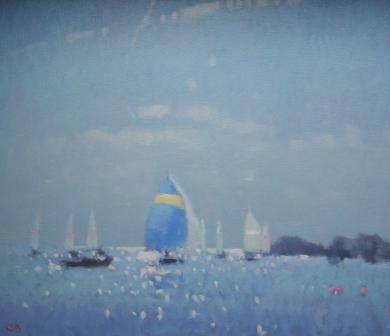 In ''Sunlit Sea'' Stephen has captured a perfect sailing day off the British coast in Devon. Stephen''s treatment of light and reflections creates an idyllic and peaceful vista. Over the last few years Stephen Brown paintings have proved to be a good British Art Investment progressively appreciating in value. With this quality of art work and enduring quality it is easy to understand why.